Once again, I am stunned by the obvious. All my life I have happily grilled steaks, burgers, prawns, fish, vegetables, paellas, etc. on a charcoal grill. And while I used charcoal hundreds of times, and vaguely understood that it was made of wood, I certainly had no clue how it was actually manufactured. And I suspect that the vast majority of marketmanila’s readers were likewise clueless about this commonly used item. Often seen for sale on provincial roadsides, freshly made charcoal can run anywhere from PHP100-160 per sack, depending on the time of year and relative abundance of stocks. And after seeing how this is made from scratch, I will NEVER EVER quibble or bargain for this product again. It is perhaps taking the whole “do-it-from-scratch” mantra a bit to the extreme, but this home-made charcoal was the basis for several recent lechons we roasted and I’d like to think it made a difference! Arrange the chopped up pieces of wood inside this enclosure, in a relatively tight and orderly manner. 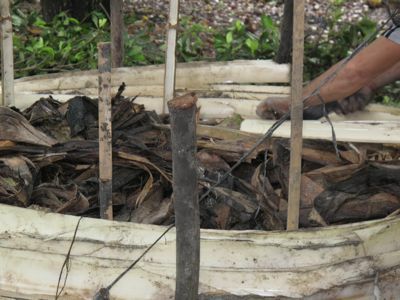 Once you have placed all the wood inside, cover the wood with older pieces of banana trunk so that you can imagine wood inside an “oven”. Cover the entire top with soil and as you can see in the photo above, one should have what looks like a makeshift oven with soil walls and insulation. At the bottom are three areas where a small flame can be started and checked over the three day (yes, that is three days) smoking/carbonation process. Arnold then lit a small fire with kindling at one of the vents or holes at the bottom of the charcoal oven, and fanned it until smoke started to billow out of the other “exits”. At this point, he checked to ensure that the walls and roof of the oven were solid and that no smoke escaped anywhere except the vents, for if it did, it would be an entryway for oxygen that would lead to a large bonfire and ashes, not charcoal. 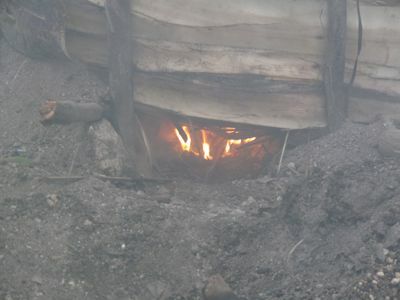 The flames died down relatively quickly and the embers provided the heat/smoke needed to turn the wood into charcoal. I am not sure what the actual chemical/physical processes were at work, but after three days (with constant checking to see if the embers were live) the wood turns from a fresh brown with some sap to a dark charcoal grey/black! 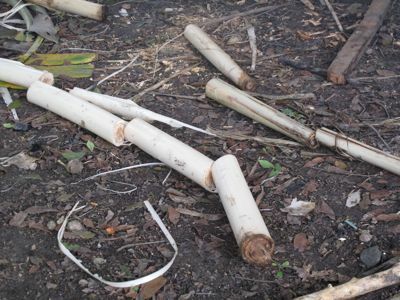 Here a photo of the core of the banana stalks used for the oven. If these were the right variety of bananas, the core, or ubad, would be edible thus nothing would be wasted. The charcoal Arnold made from scratch was brilliant. Huge chunks that seemed to burn longer than store bought, or commerically manufactured charcoal. We cooked several pigs using this home-made charcoal, and they tasted terrific. Some photos on this post taken by AT. interesting! one of the reasons i look forward to checking out this blog, i always learn something new. in korean cooking, they also take great care in looking for the right charcoal as it makes a world of difference in grilling meat. their charcoal is made in brick kilns. the method you featured is much more ingenious. who’d have thought banana stalks could be used for a makeshift oven. 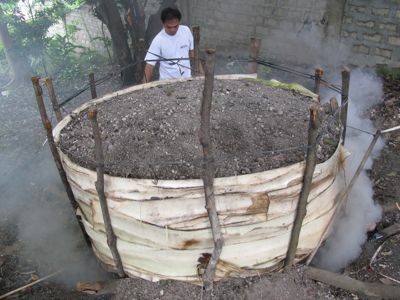 Amazing never seen a charcoal made from scratch before …. I would say charcoal and wood fire cooking are still enviromentally friendly compare to LPG and electric stove. How bout hanging a Bangus and Beef tapa beside the smoke next time? wow! very informative indeed, especially for city folks like us who have no idea how these are made, let alone seen one in the making. this really sets apart your blog from the rest. Btw, from what wood/tree were the charcoal used for roasting the pigs sourced? 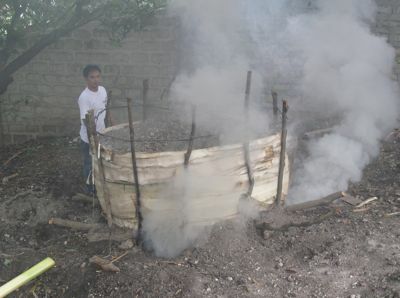 Would there be a discernible difference on the flavor of the lechon if different types of woods were used as charcoal? 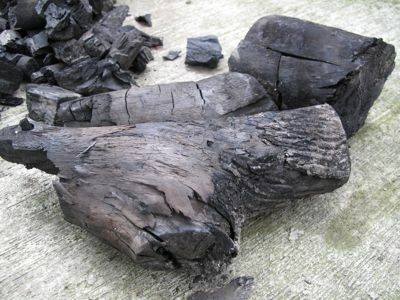 very resourceful, MM, would any wood be ideal for making charcoal from scratch? found some mahogany waste in my backyard. useful post, thanks. 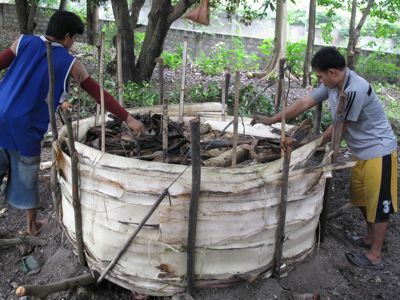 Most of the wood used in making charcoal are actually HARD WOOD like guava tree, ipil-ipil or bakawan. Making charcoal is a very labourous kind of job and besides having enemies simply like the source of wood(land owner) forestry officials, environmental bodies and even competing with other charcoal producers can lead to fatal misunderstanding.. imagine the weight of the fresh wood to bring to your ingeneous factory, cutting it and treating it up to finish products…and besides, still cheap and may not cover the actual work done to compensate in financial means…charcoal business are very though profession if you call it profession since i normally called them environmental petty hazards…Im very familiar with this work but using different technique as to dig a hole and cover it with dirt or sand. In our town, we dont go to the jungle to cut trees but instead we resort to the river banks to collect woods that were trashed by the floods, means we do charcoal making seasonal as after thypoon slashed and flood. we simply allow the nature to bring woods to us just over the river banks then its up to us to collect them or burn them right where it was found….still, people around even few hundred meters away complains about our smoke belching works…..
Wouldn’t using charcoal be carbon neutral? As the tree grows, it absorbs carbon. When you burn it, the carbon is released. When the next tree grows, the carbon is absorbed again. Ad ininitum. It’s pumping carbon out of the ground (oil, gas, LPG) and burning it that creates the carbon problems. Hei MM, hindi ako clueless. Gumagawa kasi kami noon ng uling sa aming kaingin noong buhay pa si Tatay. We were supplying a local bakery at saka ilang tindera sa palengke ng Antipolo. We cut wood from the overgrown areas of my grandfather’s property to encourage new growth. So, it is not totally an environmental hazard. …very informative, MM but I can see the fire department knocking on your door if you were here Arnold!…esp. in the summer ! Hey, Arnold…you could be on SURVIVOR!! !….am not kidding! I never knew that! Hahaha!! What a laborious process! So true that if we knew their origins, we would have a greater appreciation of products we take for granted. Thanks for this post, MM. Amazing, I had no idea how involved making uling was. I do know that the smell from that type of charcoal certainly beats the petroleum-laced essence of charcoal briquets. another informative blog!! MM, I admire your boundless curiosity and learn something new every time I log into market manila!! thank you! Unfortunately, wood or charcoal fires are **severely** detrimental to the environment. Global warming is not simply carbon-centric, there are many other things that contribute to it. 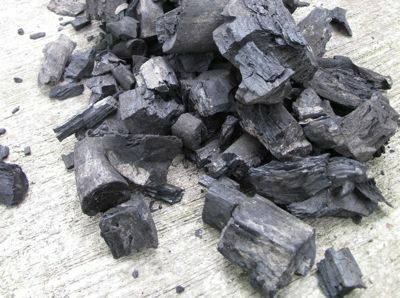 In the case of wood/charcoal fires it is not just the carbon dioxide released but also the particulates (soot), which contribute to the smog that blows from Asia to the US (following the wind) and to global warming. There is a new project in India to address inefficient and polluting wood/charcoal stoves with more environmentally friendly cooking methods. Having put a gloomy cast over charcoal fires in the preceding post, I must say I love the flavour of food that’s cooked over charcoal. I have a combination gas/charcoal grill that is relatively efficient and if I am using charcoal it is always “real” (wood) charcoal (and not “briquettes”)…mesquite, oak, sometimes apple- or pear-wood. But grilling over wood is an indulgence for me nowadays (and yes, I realize that it is still an apparent necessity in some countries…thus the attempt to convert to cleaner cooking methods). There are quite a number of places in the US where outdoor barbeques and wood fires are being regulated because the pollution issue is unfortunately quite real. Indeed an environmental nightmare but food grilled over charcoal is so yummy!Thanks for this informative post. I have always wanted to go to this restaurant in Spain called Asador Etxebarri. The chef is known to be a genius in using his custom made charcoal to flavor his creations. He makes charcoal out of oak, apple, grape, orange, and olive woods. One of his signature dishes is iranian caviar infused with applewood smoke. 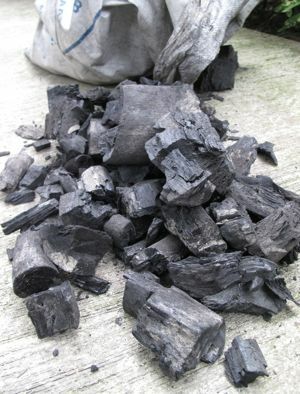 Now that you’ve made your own charcoal perhaps you could experiment with various types of wood. betty q, same here, police car and a fire truck with sirens wailing making sure that the neighbours and the sorrounding areas are aware of the danger. Just this morning, the question of how charcoal is made crossed my mind as I passed by a market selling heaps and heaps of the stuff. Then I came across this blog…….. now isn’t that amazingly cool!! Educational post. We have charcoal, then lechon, all home sourced. Excellent work MM. 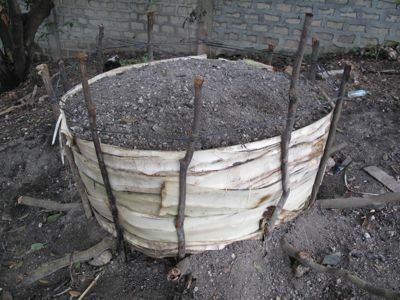 Travelling around the country, you always see people building fires in the yard, I used to think they were making them to keep out the mosquitoes, but now that I’ve read this post, it might just have been charcoal ovens. 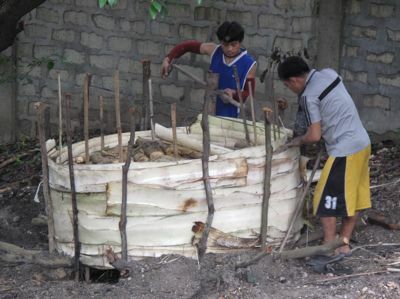 In Dumaguete, the tuba bread is baked over charcoal made of coconut husks. Adds a latik like smell to the bread. In the 1950s, in the Zambales mountains	, one would meet the occasional shy aeta. I came across some above ground earth ovens, which the guide explained were used by the local tribesmen for charcoal making. I did not examine them closely, but it seemed that access to air was restricted, so the process involved slow smouldering. The process you describe is interesting and informative. Just several days ago on a trip to Egypt , Port Said, Cairo and Alexandria were unbelievably blanketed with haze even in the early morning during our two days’ visit. Think of an area nearly 300 km square! I thought it was “just” smog . Apparently, as I was told, it was also due to burning of grass or whatever agricultural activity was going on, pretty much like a kaingin on a wide scale. It really was a damper as we could not see the orange pyramids thru the haze. Thankfully, the ones in Giza were too colossal to be obscured. Some complained of pain in the eyes and I had some shortness of breath. Between vehicular emissions ( I am not aware that Egypt has made similar efforts in controlling emissions as much as India has) and the burning, I wondered how much they contributed to carbon emissions. Not much fun living in a fragile world where we have to act more responsibly in anything we do, but that seems to be the way it is/should be. Hi Betty Q, thought you too had a forced rest from typing ! Everything we do has a price. I suppose one can either accept that and the consequent need to judge our everyday choices, or continue happily (and obliviously) onward…but we have seen with the environmental nightmares we now face that the latter course is probably not the wisest! I think the readers of this blog are presumably all able to enjoy food as something more than just sustenance, and so should have an even greater appreciation for the food we enjoy. Personally I think that we ought to remain acutely aware that even a casual choice of say, eating barbequed meat (even if it is a humanely raised pig roasted to perfection over artisanal charcoal) has some environmental cost. I’m not at all saying that you shouldn’t enjoy this (or any other pleasures of life)…just be aware that such pleasures shouldn’t be taken lightly, and if you can minimize social or environmental costs (e. g., pollution, exposure to health hazards, animal suffering, waste of food or fuel), then try your best to do so. Kurzhaar: Amen, I say. I also wondered how much carbon emissions and environmental pollution I had contributed on what I feel was a well deserved vacation, between the plane I took and cruise liner I boarded where I tried to use my towels for several days in a row and trying not to flush the toilet everytime I emptied my bladder. I say mea culpa as well. Now i know, kaya pala madami akong napapansin na usok sa bundok ng Arayat..nagkakarbon pala. At napansin ko nalang na nakakalbo na ang bundok. Thanks for the post MM! Tin, I would be extremely skeptical of this claim–if this is organic (carbon-containing) material made from water lilies, I can’t see how you could combust this to hydrogen. Hydrogen (gas) is not a product of oxidation (burning). This makes no chemical sense. Kurzhaar, I learned about it from this article- http://www.philstar.com/Article.aspx?articleid=407491 It did not elaborate on the process but it seems reliable. Tin, I am a scientist by training. The reporter either misreported the quote, or the person quoted as saying that this “green charcoal” only releases hydrogen and not carbon dioxide is just plain WRONG. Sorry, but you CANNOT combust or oxidize organic (carbon-based) material to hydrogen in order to produce heat. That is a physical impossibility, like a perpetual motion machine.